Many of our projects have been highlighted on architecture tours, praised through awards and designations. The following is a brief look at our top 10 favorite residential spaces, in which we highlight the beauty of the design and how we best incorporate high-performance architecture into each project. 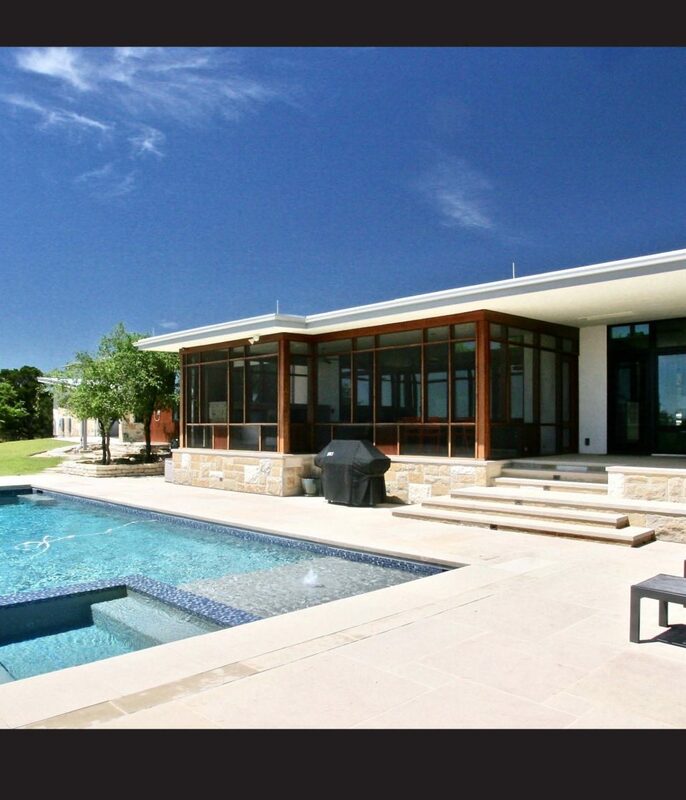 This holistic or “whole house” design approach was adopted from the inception of this project to ensure that this contemporary designed home would achieve the following goals: beauty, comfort, energy and resource efficiency, durability, lower maintenance, within an environmentally conscious, healthy and safe environment. 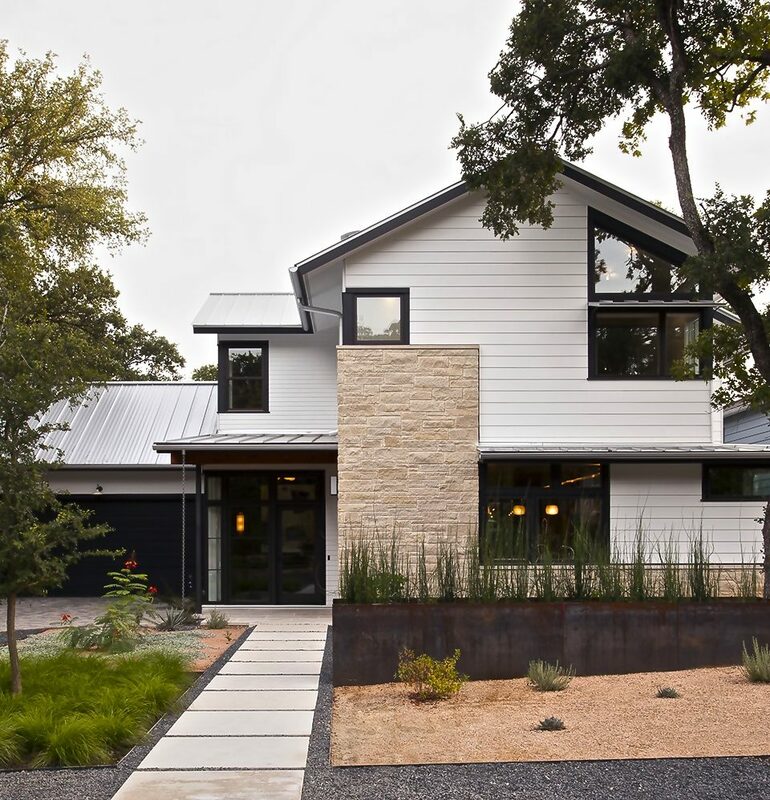 This home demonstrates that the present-popular Modern style can respond well to our harsh summers in Central Texas. 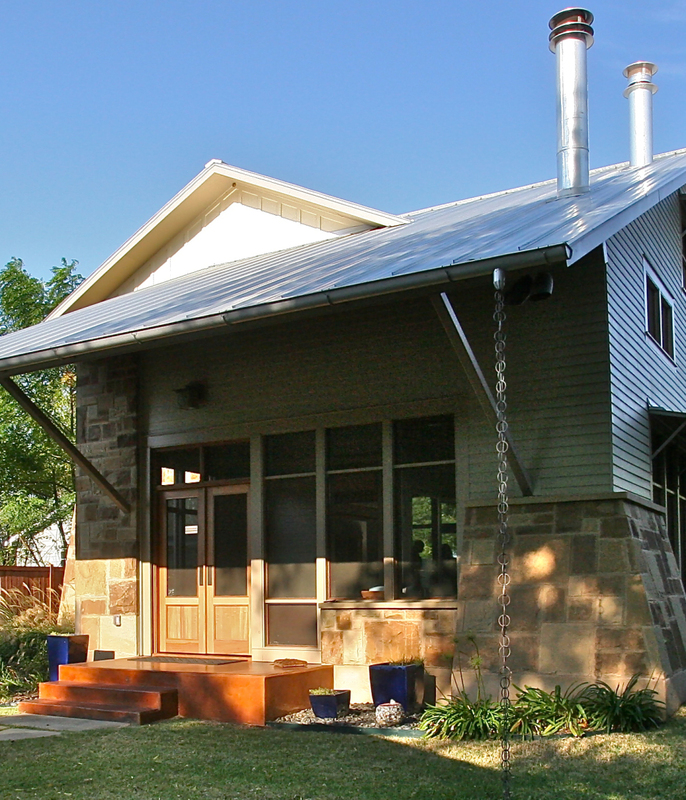 It displays attributes not often associated with homes of the Modern movement – soft balanced natural day-lighting, remarkable comfort via passive solar control measures, energy efficiency without reliance on expensive and maintenance-intensive Green “gizmos”, and lower exterior maintenance – all by architectural design. The client desired the nexus of environmental stewardship with “high performance” comfort & health attributes. Total reliance on rain-water collection, harmonious response to the site’s micro-climate, excellent Indoor Air Quality without the reliance on a separate mechanical system, enhanced natural ventilation strategies, and a lovely bug-free semi-outdoor “living room” that comfortably connects one to the outdoors are a few examples of the architect’s approach to Green By Design that results in a home that exceeds the expectations of its owners – yet still treads lightly on its natural surroundings. Perhaps the greatest achievement that this project represents is convincing a family that had become accustomed to living in 5000-plus square feet in the far out Austin suburbs to be comfortable in a home significantly less than half that size, on a piece of property one tenth the size, in a location close to downtown and the amenities they would frequent. These homeowners “bought into” the idea of reducing their carbon footprint by retiring into a high performance home that would demonstrate energy efficiencies and contain healthy indoor air quality; attributes that would allow them to “live well” in a soft, contemporary style. The project programming and interior layout of this home were developed with “green” living in mind from the get-go. 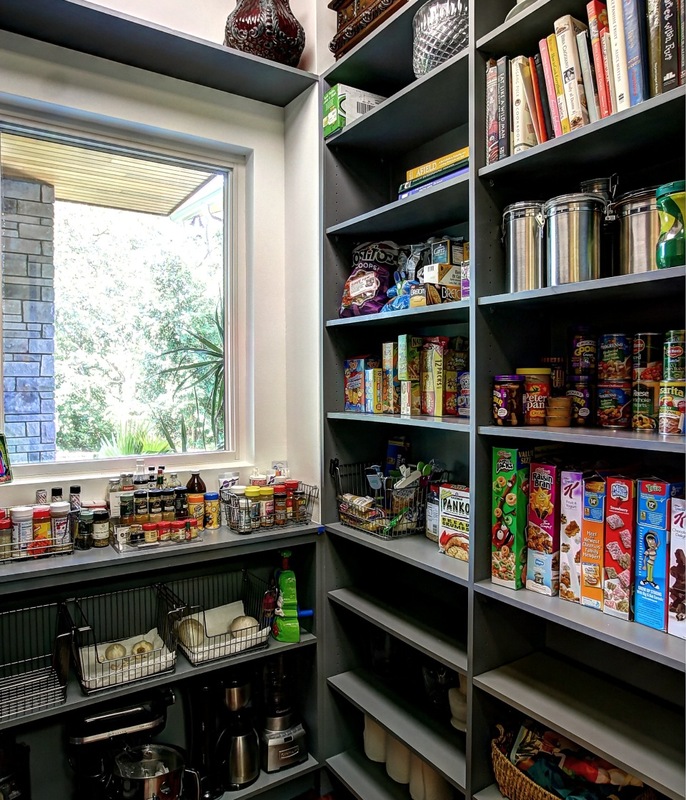 Spaces are multi-functional. It was programmed and designed so that it functions also as a pleasant patio, outdoor cooking area and pet washing station. 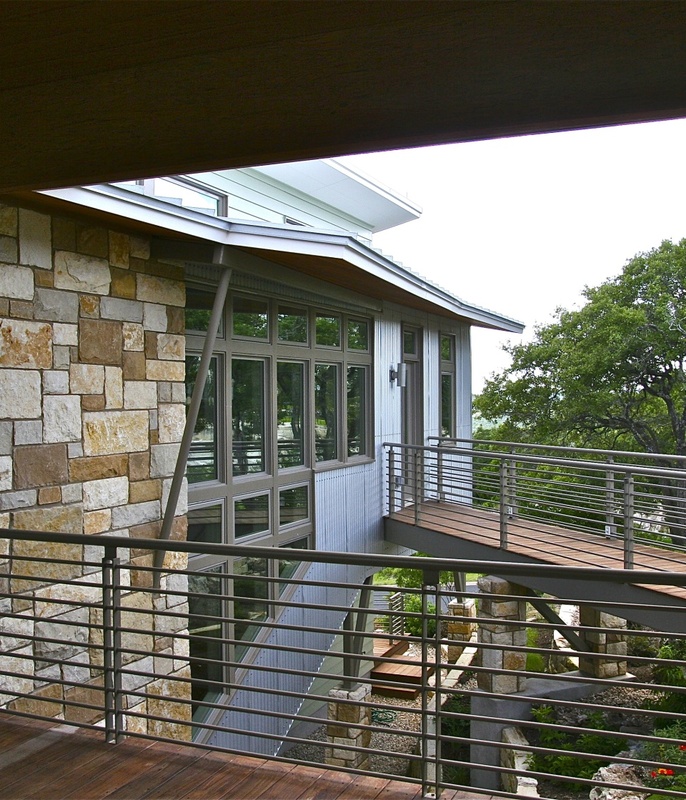 The screened-in porch is situated to take in the prevailing breezes, serve as a true extension of the open floor plan living area, and as a breeze collector working in sync with the “thermal siphon” stair tower, with it’s shaded clerestory windows on the NW side of the home. To minimize the home’s impervious cover footprint and its roof area, all bedrooms are upstairs, contrary to conventional real estate development thinking. This allowed for vertical zoning of separate air-conditioning systems which minimizes conditioning unoccupied areas during times of the day when those rooms are not in use. 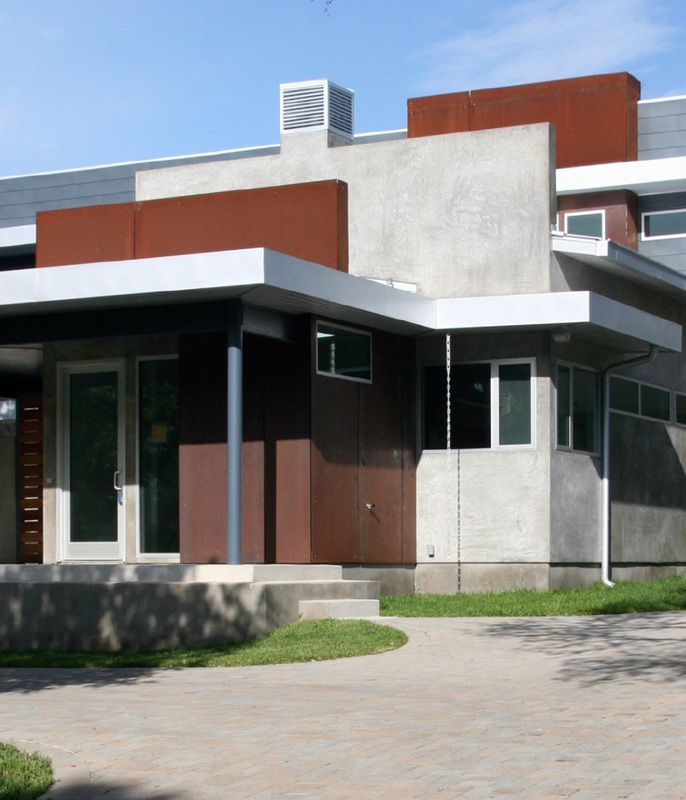 Tucked into a neighborhood called Tarrytown you will find a unique house that we call the Urban Art Residence. One look inside and you will understand why the name fits so well. Located on a lot so steep it was once deemed unbuildable, the design of this home takes full advantage of the prevailing breezes, spectacular views, and the owners’ desire to remain in the neighborhood they call home. The house hugs the rocky ridge and steep slope, providing a top floor to accommodate the owner’s plan to ‘age in place’, while the downstairs is a space for family visits. The best compliment to this home’s energy efficient design? In the teeth of the brutal 2011 summer, this house was the venue for a fundraiser that was cool and comfortable – and utility bills averaged $127/month. This holistic or “whole house” design approach was adopted from the inception of this project to ensure that this contemporary designed home would achieve the following goals : beauty, comfort, energy and resource efficiency, durability, lower maintenance, within an environmentally conscious, healthy and safe environment. © 2019 Barley|Pfeiffer Architecture. All Rights Reserved.